Our quality chest holster is the best nylon pistol holster your money can buy. They are rugged and stitched with pride to last for years of use. All of our Man Gear Alaska chest holsters are manufactured by hand right here in Alaska by Alaskans. The tactical look and practical utilization design of our holster is hard to beat. Our holsters are made with 1680 denier nylon, which in Alaska, is a huge advantage to a leather holster. In bear country, guns must be quickly accessible so holsters are worn on the outside of clothing, even rain jackets. The chest is the preferred location to wear holsters for fast accessibility. 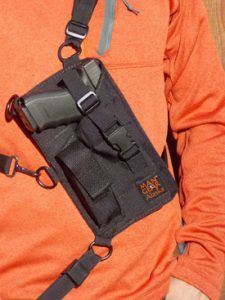 Since weather changes here in an instant, a holster worn on the chest often endures rain, mud, saltwater, abuse from brush, and anything else the extreme Alaskan seasons can dish out. Unlike leather holsters, our tough nylon chest holsters can get soaked and be hung to dry with no worries of shrinkage, stretching, cracking and dry rotting; no oiling needed. We construct our holsters with double layers of fabric and inner waterproof layers which gives them rigidity. The multiple stitching is made with a heavy UV blocking thread. All tabs and straps on holsters are a high quality nylon webbing. The D-Rings are a heavy welded wire in a black dull finish. These holsters are tough, keep their shape, and are comfortable enough to wear on your chest all day. We manufacture a line of chest holsters that fit a variety of guns. If you have a semi-automatic handgun such as a Glock, Sig Saur, Smith & Wesson M&P, or just about any other name brand in 9mm, 10mm, .40, .45, and even .22, check out our semi-auto holsters page. We have semi-auto pistol holsters from the compact size, ranging all the way up to the bigger guns like the Desert Eagle. Our revolver holsters are uniquely manufactured to accommodate the .357, .44, or The Ruger Blackhawk, Super Redhawk, Alaskan or .454 Casull with minimal adjusting. In addition to the caliber versatility, we offer both left and right hand draw options and a range of holsters to accommodate varying barrel lengths; take a look at our revolver holsters page to see available options for revolver holsters. We even carry specially designed holsters for the larger handguns like the Smith and Wesson .460 and .500. The X-Frame holsters also can be ordered in left and right hand draw, and have several length options to fit the most standard barrel lengths for these particular guns. The X-Frame chest holsters have two cartridge and accessory options to choose from depending on your needs. If you can’t find what you are searching for, please give us a call and we'll be happy to help you find the right holsters for your handguns. We have three cartridge carry options for the revolver chest holsters; the cartridge loops with a cover, cartridge loops with a cover and an extra tool pouch, or speed loader pouch(es). You choose how you like to carry your rounds on your holsters. We look forward to serving you and we'll strive to provide both high quality service and holsters. We are proud of our product and are committed to quality and durability. So much so, that should this product fail due to normal use, we will be happy to repair or replace it. All you need to do is send it in. No receipt required.